Piloted a public speaking program for an international corporation. You won’t want to miss how he did all this and his advice for other business owners or would-be owners. Businesses owned and operated by couples or family members have additional issues to deal with to be efficient and not end up in your own version of “Family Feud”. Learn 5 ways to make your business more livable and prosperous and how not to take your work home with you. Everyone will get a chance to introduce themselves and add their points about family businesses. Tagged With: BOSS-Talks, BOSS-Tools, Elijah May, Inspiring Entrepreneur, Jan Triplett, Ph.D.
Heather Poggi- Mannis is a woman of many talents and a part-time entrepreneur. Hear how she juggles all the parts, including being a jewelry maker and a member of the Austin Ring of Magicians. Stay to discuss finding sales talent. If you are not going to do all the selling for your business, what are the options? You can outsource sales or you can hire someone. But who do you want and what do you really want them to do? There are at least 7 options and we will discuss all of them plus costs and pay. This will be especially useful for those who have tried to hire sales people before or who want to add to their existing sales force. This is monthly program of the Business Success Center held every month at Noon Central Time. 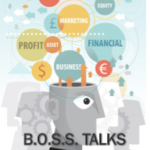 The next BOSS-Talks Success Tools program is Austin’s Hidden Gem: Meet the Regional Foundation Library and “Business Remodeling” with Business Success Center’s CEO Jan Triplett at Noon, July 5, online. Heather has always enjoyed working with her hands and she has always enjoyed looking at and wearing jewelry. Heather’s Magpie Jewelry is a happy marriage of the two! She’s been building jewelry since 2007. Initially she was wearing her own creations and giving them to family and friends. Then, in 2010, someone paid her to build the wedding gifts for bridesmaids/groomsmen and mother of the bride. That is really when she started looking at it more seriously. This inspiring parttime entrepreneur admits she’s not at full business mode but she is enjoying the part time aspect of it. Her jewelry is showcased on Facebook at Heather’s Magpie Jewelry. March’s Inspiring Entrepreneur: Amy White, President, TransTex, License & Permit Solutions, Inc. Helping keep the roads safer is the job of TransTex, LPS. President Amy White and her company make sure trucks have the right permits and inspections and that makes travel safer for everyone. With 20 years experience in this primarily male industry, she has great stories to share about her entrepreneurial journey. In addition, since every business deals with some kinds of permits or regulations, you’re going to want to hear her tips to make sure you don’t miss a critical deadline or new state or federal requirement. Thinking about dumping the job and starting the business? If you have a business, what about starting another business or expanding? Consider these 10 options to choose what’s right for you. BOSS-Talks Inspiring Entrepreneur focuses on sharing stories of entrepreneurs that you can use to organize your business for greater efficiency and profitability. Airport development business award-winner Ray Brimble, Lynxs Group, founder. Lynxs was founded in 1994 to develop and manage airport-related properties domestically as well as internationally but entrepreneurial origins remain at the core of their endeavors. It focuses on aviation real estate, logistics and cargo movement and storage. What would you like to know? Prepare and ask your own questions. There will be time for you to ask questions! Everyone will get a chance to introduce themselves and add their points about business inspiration. This is part of the Business Success Center’s BOSS-Talks (Business Ownership Success Series) and Profit Mover™ program for increasing profitability and efficiency and to take business to the top. BOSS-Talks Inspiring Entrepreneur online live Interviews are the 4th Monday of the month January-November. The next interview is January . At the Business Success Center, we open doors to your business success! How do you grow your place into a neighborhood hub and develop a following? How do you deal with competition that moves in across the street and down the block? How do you keep good staff who have other interests — art, music, ecology, etc.? These are just some of the kinds of questions that may be relevant to your business success. Join Stephanie and Jan for this lively and inspiring interview and discussion online. What would you like to know? Prepare your own questions. BOSS-Talks Inspiring Entrepreneur online live Interviews are the 4th Monday of the month January-November. The next interview is July 24 noon. Shelley Delayne, Founder of South Austin’s first co-working space, Orange Coworking, who went from mentee to mentor. Shelley Delayne saw a missing piece for a special part of Austin and filled the gap. She now connects entrepreneurs to the resources needed to support their success. Orange Coworking has a thoughtfully-designed environment in which to work, friendly humans, useful classes and workshops, and curated connections to a rich network of professionals and other businesses. Prior to Orange Coworking, Shelley’s career included everything from retail management to graphic design and small business consulting. She has a passion for helping people succeed in their lives and businesses, and believes deeply in the power of entrepreneurs to change the world for the better. Born and raised in St. Louis, Shelley moved to Austin four years ago with her husband, a native Texan, and is glad to be part of the inspiring entrepreneurial community of Austin. Here’s how to join us online. BOSS-Talks Inspiring Entrepreneur online live Interviews are the 4th Monday of the month January-November. The next interview is May 22 noon with Sam Alexander. He then pursued a career as a diamond and gemstone buyer in Dallas, TX where he was employed for 10 years. After much thought and careful planning, he then moved back to his home town in Austin, TX where he founded his jewelry business over 18 years ago. From the start, Joseph specialized in the arena of diamond sales including the unusual, surprising and sometimes the extravagant. In the years since, the business has grown and Villarreal Fine Jewelers has cultivated a loyal clientele that appreciates and share the ethos of beauty, quality, innovation and excellent customer service. BOSS-Talks Inspiring Entrepreneur online live Interviews are the 4th Monday of the month January-November. The next interview is inspiring entrepreneur Chad Jewell, President of Austin Office Space, March 27, noon. RSVP @ http://bit.ly/JewellInspiringEntrepreneur. Focusing on your success by learning from others. Inventing is a business. So is law. Add in business partner and you have a three-prong attack on success. That’s the road of Andrew Eisenberg: inventor, lawyer, partner. Hear how he wears all three hats but bring your track shoes! He’s also a new dad so he’s got a lot going on. His entrepreneurial journey is a study in organization. Join us online. Here’s how. 1. Please join my meeting, Sep 26, 2016 at 12:00 PM CDT.